Ulcerative Colitis and Crohn’s Disease are two chronic conditions that categorize inflammatory bowel disease (IBD). 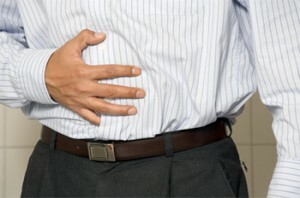 Both conditions involve inflammation that affects the lining of the intestines. To read more about these 2 conditions, visit our Ulcerative Colitis & Crohn’s page. This post will focus on a naturopathic medicine approach as it relates to IBD. In the conventional medicine world, these 2 conditions are viewed as “incurable, life-long diseases”, where the individual will remain on pharmaceuticals for the rest of their life. I actually agree with that for the most part, IF a person only pursues conventional treatment (drugs). However, as a naturopathic doctor practicing in Minnetonka, MN who also has a history of Ulcerative Colitis, I’m here to tell you there is another way! For the record, I am not “anti-conventional medicine” by any stretch of the imagination. It has a place and plays a significant role in medicine. However, naturopathic medicine approaches disease and health through a different lens, a different philosophical approach. An approach that involves looking at an individual from a holistic perspective, regardless of the condition or diagnosis someone has been labeled with. Naturopathic doctors order and utilize conventional testing as it relates to Ulcerative Colitis & Crohn’s Disease, such as colonoscopy, imaging (X-ray, CT, MRI, etc. ), and bloodwork. In addition, we utilize other specialized diagnostic laboratory tests to help us identify underlying imbalances in order to treat the cause(s) and restore health. The primary goal in the treatment of Ulcerative Colitis & Crohn’s Disease is to reduce inflammation and in turn heal the lining of the intestines. Many factors can cause inflammation, such as eating foods you are sensitive (intolerant) to. One way to identify food sensitivities is an elimination diet where you avoid a large variety of foods for a period of time and then re-introduce them one at a time and observe any symptoms and how you feel, etc. Another effective method is to have special bloodwork drawn in order to test for IgG immune mediated reactions to different foods. We have found IgG food sensitivity very valuable in the treatment of IBD. We can test 184 foods to see how your immune system tolerates the foods you are eating. Another way to assess inflammation in the gut is a Comprehensive Stool Analysis & Parasitology x 3 testing. This specialized type of stool culture tests dozens of different markers in the digestive system such as beneficial flora levels (probiotics), inflammatory markers, yeast and bacterial overgrowth, parasites, and how well you digest carbohydrates, fats, and proteins you are consuming in your diet. I often explain to my patients the body has an innate ability to heal itself. But, this equilibrium can get so imbalanced it needs a “push” in the right direction. I essentially serve as a mere “catalyst” to give the body a push in the right direction so it can then return to balance and heal, on its own. Some of these “imbalances” can include food sensitivities/intolerances, dysbiosis (imbalance in the microflora of the gut), nutrient/mineral/amino acid deficiencies, hormonal imbalances, damage to the intestinal lining, and more. Another key factor is stress and anxiety. Stress plays such an integral role in our overall health but particularly in digestive disorders, such as IBD. Without addressing triggers that lead to stress and anxiety, this can result in a significant “obstacle to heal”. Our adrenal glands, which sit atop our kidneys, play a significant role in our stress response. To learn more, read our recent blog post on Adrenal Fatigue. Read what others who used to suffer with IBD have experienced from utilizing naturopathic medicine! He has been an absolute blessing! He listened to me when no other doctor would. My first appointment with him we went through everything, not just my Crohn’s symptoms but my anxiety about it as well. I left that appointment feeling optimistic about my future, a feeling I hadn’t felt in a very long time. Just a few months after that day I was feeling so good and after about 6 months I had never felt better in all my life. I have had my ups and downs throughout the year but my downs are nowhere near what that had been before him. I am so happy to report I have my life back and look forward to what the future holds for me. I am so grateful to have Dr. Nate in my corner and thank him for listening to me when no one else would. About 2 years ago, I grew tired of being sick and was ready to make a change in how I approached my treatment. I am so grateful that I found Dr. Nate Champion in my search. After my first appointment, I knew I was on to something that would be life changing. Dr. Champion really listened to me and took the time to understand my story. After extensive testing and information gathering, Dr. Champion developed a comprehensive treatment plan for me. Within the first year, I was symptom free and off of the medication that produced awful side effects and presented a high risk of doing long-term damage to my body. My symptoms continue to be managed with lifestyle changes, nutrition adjustments, and supplements. I am also more emotionally balanced with the support of homeopathic remedies. When I find myself losing focus with my treatment plan, Dr. Champion is there to provide me with non-judgmental encouragement and support. I have a 23 yr old daughter, who had her colon removed at 19, and has not gotten any better. Her flare ups are habilitating, and even the strongest meds have not helped her. She is in constant pain, has 3 large cysts on her ovaries causing her additional discomfort. ( they ar benign) Was referred to an oncology surgeon, who hesitates to proceed as her case is very complicated. We live in oregon and have the ability to travel. She also has blue cross insurance. Can you help us, or at least refer us to someone you would recommend. I greatly appreciate your time regarding this matter. I’m so sorry to hear of your daughter’s suffering. I live in MI and had a consult with Dr. Nate just today. I am very optimistic that he can help me via long distance. I would call and ask for a 10 min. free consult. Insurance doesn’t cover most of the testing which stinks, but my health – everyone’s health means everything. I’m digging up the money somehow because I feel I’ve found the support and wisdom and expertise I need in Dr. Nate. I wish your daughter and you the very best.